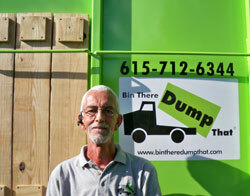 https://nashville.bintheredumpthatusa.com/about	Bin There Dump That Nashville	https://nashville.bintheredumpthatusa.com/img/franchisees/59.jpg	7913 TN-100, Nashville, TN	Contact us for more details. Joey and Travis Bossier, a father-son team, are natives of Franklin/Middle Tennessee. Joey is happily married with 3 children and 4 grandchildren and is a member of the Williamson County Chamber of Commerce and an Associate member of the Home Builders Association of Middle Tennessee. Nashville is home to the NHL's Nashville Predators, the NFL's Tennessee Titans and the MiLB's Nashville Sounds. In addition to sport teams, Nashville is home to the many students attending Vanderbilt University, Belmont University and David Lipscomb College. The Opry, an American icon in Nashville, Tennessee is world-famous for creating one-of-a-kind entertainment experiences for audiences of all ages. Franklin, Tennessee's Williamson County is home to many country music stars and was selected as one of the best small towns of the USA.